Our dental office is encouraging kids to "play it safe" and consistently wear mouthguards and other protective gear during competitions and practices. Football, soccer, baseball, hockey, basketball, and many other youth sports can all be hard hitting, and the members of Dental Designs, LC want to ensure that our patients, and their teammates, are properly protected from sports related injuries to the jaw and mouth. Injuries to the mouth and jaw can do a lot of damage and some injuries can include a lifetime of maintenance and repair. Facial protection is an easy step in preventing trips to the emergency room. Many kids are not wearing mouthguards and facial protection during sporting competitions and practices. Parents, coaches and kids need to understand the prevalence of sports injuries and know that many sports injuries can be reduced or prevented by wearing the proper protective gear. We are encouraging patients and their parents to go to www.momsformouthguards.org for more information. Please contact our office to inquire about the fabrication of a customized sports mouthguard for your child or yourself. Professionally-made properly fitted custom Mouthguards are recommended for all contact and collision sports. 1. Avoid additional trauma to tooth while handling. Do Not handle tooth by the root. Do Not brush or scrub tooth. Do Not sterilize tooth. 2. If debris is on tooth, gently rinse with water. 3. If possible, reimplant tooth and stabilize by biting down gently on a towel or handkerchief. Do only if athlete is alert and conscious. Best - Place tooth in a physiologic transport medium (e.g. Hank's Balanced Saline Solution). 2nd Best - Place tooth in cold milk. 3rd Best - Wrap tooth in saline-soaked gauze. 4th Best - Place tooth under athlete's tongue. Do this ONLY if athlete is conscious and alert. 5th Best - Place tooth in cup of water. 5. Time is very important. Reimplantation within 30 minutes has the highest degree of success rate. TRANSPORT IMMEDIATELY TO DENTIST. Extruded Tooth - Upper tooth hangs down and/or lower tooth raised up. 1. Reposition tooth in socket using firm finger pressure. 2. Stabilize tooth by gently biting on towel or handkerchief. 3. TRANSPORT IMMEDIATELY TO DENTIST. Lateral Displacement - Tooth pushed back or pulled forward. 1. Try to reposition using finger pressure. 2. 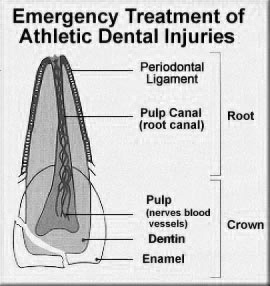 Athlete may require local anesthetic to reposition tooth; if so, stabilize tooth by gently biting on towel or handkerchief. Intruded Tooth - Tooth pushed into gum - looks short. 1. Do nothing - avoid any repositioning of the tooth. 2. TRANSPORT IMMEDIATELY TO DENTIST. 1. If tooth is totally broken in half, save the broken portion and bring to the dental office as described under Avulsion, Item 4. Stabilize portion of tooth left in mouth by gently biting on towel or handkerchief to control bleeding. 2. Should extreme pain occur, limit contact with other teeth, air or tongue. Pulp nerve may be exposed, which is extremely painful to athlete. 3. IMMEDIATELY TRANSPORT PATIENT AND TOOTH FRAGMENTS TO DENTIST.